Our Translation Assistant applies common sense logic to the problem of translating speech in real time from one language to another. Using speech recognition combined with a software translator to do word-by-word translation is not feasible because speech recognition is notorious for poor results. Word-by-word translation requires grammatically correct input to translate accurately. Therefore, translation of speech that is potentially already fraught with errors is not expected to be good. Our Translation Assistant works around these problems by using the context of the conversation as a basis for translation. It takes the location and the speaker as input to establish the circumstances. Then it uses a common sense knowledge network to do topic-spotting using key words from the conversation. It only translates the most likely topics of conversation into the target language. 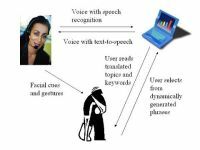 This system does not require perfect speech recognition, yet enables end-users to have a sense of the conversation.